Yet, she continued about this hockey doll. For her birthday, she asked for a hockey doll. On amazon, all I could find were bobble heads. Did more searches, in stores and such - nothing. Then, I posted on facebook "does anyone know where I can get a hockey doll?". The facebook gods smiled down on me, and my gal Stefania was quick to reply something along the lines of "Maplelea! You must check out Maplelea! 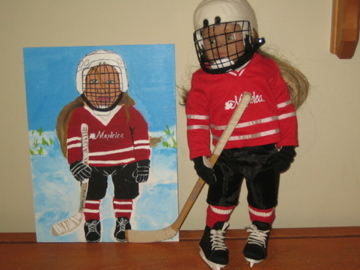 You can get complete hockey gear for their dolls!" She gave me the link and went on to talk about how her own girls love their Maplelea dolls, and have started collecting items. I had no knowledge of the Maplelea world. And, OH, how my life has changed in just a couple of months. After receiving the "Leonie" doll with hockey gear for her birthday, our daughter has formed quite a close connection with her Leonie. Maplelea is a Canadian company, and they have 5 girls with distinct backgrounds, personalities, hobbies, interests, and passions. When we received 'Leonie' we had no idea how much these interests would resonate with our daughter. 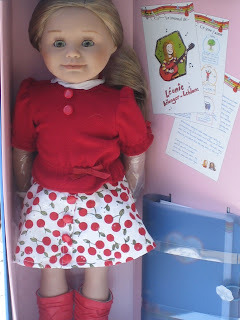 The doll came with a journal that talks about her life, and we found many similarities with our girl and this doll. Not only do they both play hockey, but they both used to play piano but found it 'just wasn't for them'. Our daughter cherishes this doll, so much that she has sewn clothes and made jewellry for Leonie with her aunt and visiting nanny, and she takes better care of Leonie's belongings than her own! The doll is put in pj's every night, her clothes neatly hung, and she's tucked in until the morning when her outfit is changed and everything again put away. (In the meantime, I'm continually asking our daughter to pick her OWN clothes up off the floor)! She even dresses her in the hockey gear when she has her hockey practices. Look at that hockey gear - it's flat out adorable! Our daughter also loves art. It is her first passion. 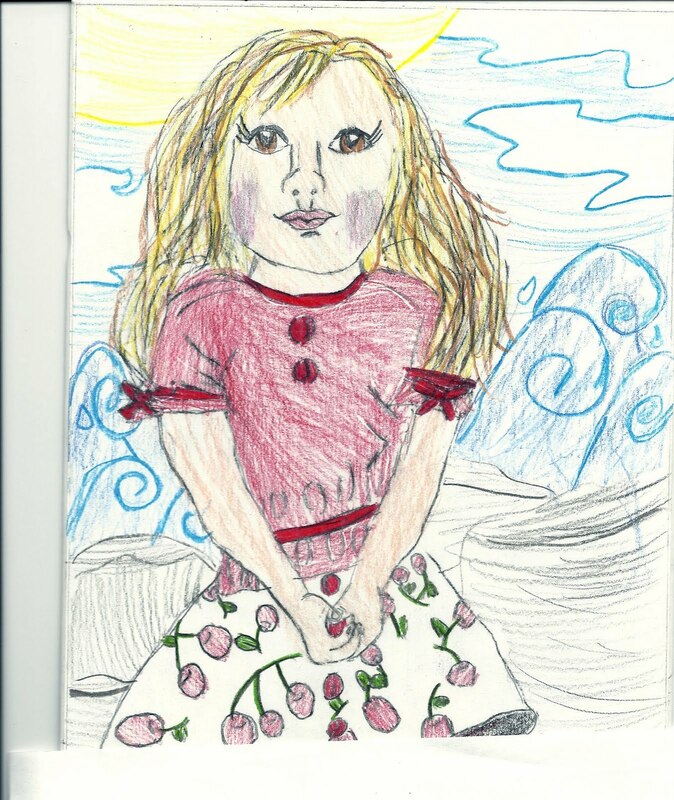 When she was a toddler, she was 'in her world' with a pack of crayons and plenty of paper. I thought all kids loved to spend hours coloring and doodling and drawing. Now I know different, as our second daughter is far more at home with music, dancing and singing (and playing piano, which does seem to be for her)! 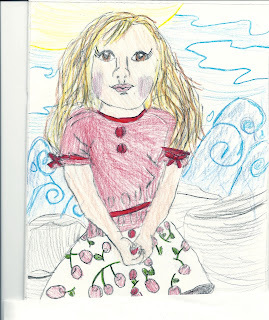 But, our eldest can spend her day sketching and creating comics and more. So, she began with a black and white sketch of Leonie in her original outfit. Then, she added color. 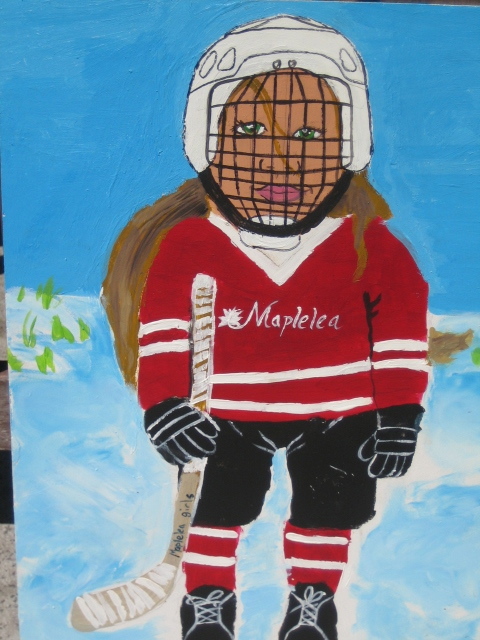 And then, she began a project at art class, painting Leonie in her hockey gear. Great post Dreena! I didn't know about these dolls before this but they do seem fantastic - and I love the bit about the flat feet. We get their catalogs in our mailbox sometimes. Not sure why, but my daughter LOVES to look through the book. She doesn't have the maturity level to take care of a doll like this just yet, but one day she may be a proud owner of one too! My daughter's friend has one of these, with the Highland Dancing outfit as they are Highland Dancers. She's getting a little too old for it now (I think she's 12) but they are really cool dolls! Thanks Judy, I was oblivious to the world too - they are only sold online, that's prob why, no splashy ads in flyers, like all other toys! I'm so glad there is another alternative out there to Barbies and Bratz! "American Girl" dolls are also high-quality, non-adultified dolls . . . have you ever seen those? I'm thrilled your daughter is so happy with her hockey doll! 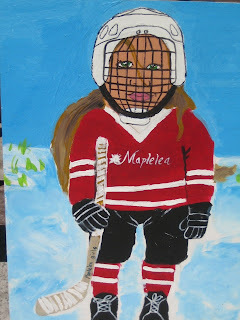 My daughter plays rep hockey and it's great to see a doll that promotes that for young girls. Good luck with vegan food at a hockey tournament though. We were at one last year and people thought I was crazy for picking the bacon off my pizza - ew! I remember when I had American Girl Dolls! 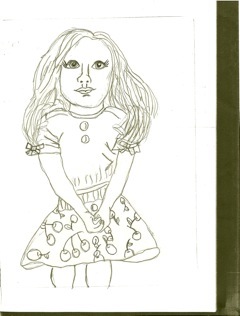 I'm really amazed by your daughters' talents, really, she's only ten? She can draw/paint so good! I agree with the Barbies and Bratz, I hate them (even though, I played with barbies when I was little, I hope my kid won't)..